The Edgeless Microfiber Polishing Cloth features a closed loop construction which is designed for wiping away polish and wax residue. The microfiber polishing cloth has a soft touch and non-stitched edge, making it safe for use on the most delicate clearcoat surfaces. 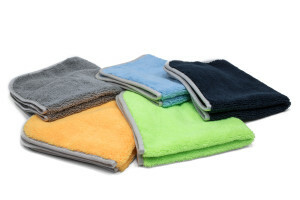 Scratches are virtually impossible with microfiber polishing towels. Even the thickest paste waxes will be easily removed with this microfiber buffing towel without caking. If you want to make the removal of tough waxes and polishes an easy task, the edgeless glass cleaning towels are the tool for you. This microfiber polishing and buffing towel excels in other applications also, most notably as glass cleaning towel. The closed loop construction of these glass cleaning towels leaves behind no lint or streaking, leaving you with ultra-clear glass and mirrors. Great Glass Towel | No lint, no streaks! Edge: This glass polishing towels features a ultra sonic cut zero edge.